Gil Rosenthal learned to scuba dive in college, and since then he’s never been able to stay out of the water. 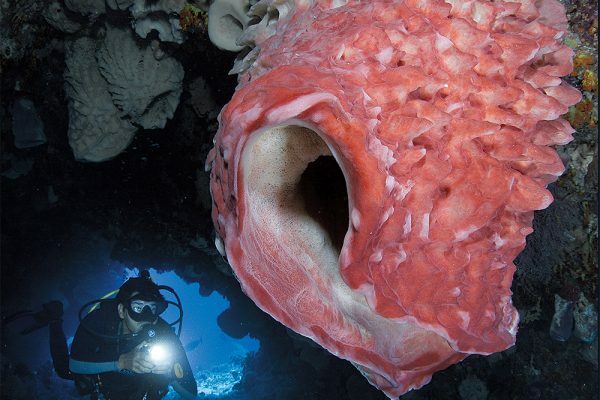 Like most divers, he’s fascinated with marine life, and how, through the experience of diving, a colorful array of beautiful reef fish — angelfish, damselfish, wrasses, and others — swim all around him. It’s the colors that excite him the most; colors unimaginable growing up in Pittsburgh. Yet, while there is certainly no easy explanation, researchers have slowly learned some clues to make the mystery less, well, mysterious. It helps to know how fish see in the first place, Rosenthal says. Then, it’s easier to understand why they’re so colorful — in some cases, even more colorful then we can see with unaided eyes — and the benefits colors and patterns have provided different species of fish, as a means of communication, mate selection, and predator avoidance. The natural starting point for understanding why fish are colorful is to understand how their eyes work. We know how ours work, but we’re not the ones the fish communicate with, hide from, or feed on. So then, we look at the construction of a particular fish’s eye. Then we can figure out what they see, why they see what they do, and how they see it. Under an ideal set of circumstances, we’d look at a typical fish eye, dissect it, test the retina for its light sensitivity, count its cones and rods — the light sensors that detect color and black and white, respectively — and pronounce judgment. The problem is, there’s no such thing as a typical fish eye, because reef fish do very different things with their vision, depending, largely, on what the fish eats and where it lives. Humans have rod cells as well as color cone cells tuned to red, green and blue light. Most small predatory and herbivorous fish have a similar setup, including tangs and angelfish. That visual range contains most of the information the fish need to find little fish, sponges, and macroalgae at dinner time while still enabling good daytime vision, when they’re more active. On the other hand, big predators tend to be colorblind, like most mammals, which is a trade-off for having good spatial acuity — that is, the ability to pick out small objects and perceive motion under low-light conditions, which is important when you feed on small objects in low-light conditions. Go figure. Anyhow, the best way for us to get inside a fish’s head and see what it sees is to compare fish sight with human sight. Scientists have spent a considerable amount of time studying the structure of fish eyes, largely because fish occur in just about every conceivable kind of situation, visually speaking. There are cave fish that live in total darkness, fish that live in black-water streams, and fish that live in crystal-clear water around reefs. The variation of eye physiology, it turns out, depends on the fishes’ habitat and the depth gradient where it lives. Since water is such an effective filter of light, the world looks different at 100 feet than near the surface. You knew that, which is why you won’t be surprised to learn that fish that inhabit deeper waters have eyesight tuned for less light — more green-yellow than blue-green. In most cases, they may even lose the ability to see red. Many fish actually change their visual systems to optimize the different habitats they use during various stages of their life history, Rosenthal says. Some eels express different eye-pigment cells depending on whether they’re in fresh water or salt water, and surf perch, which live in the kelp forests of California, have different visual sensitivities depending on whether they live in low-light conditions under kelp fronds or out in the open where it’s brighter. With such a close match between microhabitat and the way their rods and cone cells are tuned, they maximize the amount of visual information they can get from the environment. What gets a little harder to imagine without special video gear is, functionally speaking, the big difference in fish sight. About half of all fish can detect ultraviolet (UV) light, and between 20 percent and 30 percent can actually see it as a distinct color. Damselfish and sergeant majors, for two, have the full complement of color vision, plus a fourth set of cones on their retinas tuned to detect UV light. Both are plankton eaters, and plankton, coincidentally, reflects a lot of light in the UV spectrum. As the old saying goes, beauty is in the eye of the beholder. It’s true as well, it seems, with color. Given the way fish eyes are constructed, they may very well see the whole world differently. Since fish eyes can be equipped completely different from human eyes, it’s something of a guess to figure out what they see when they look at their neighbors on the reef. And while they may look pretty to us, we’re not, as they say, the intended audience. In fact, if we think they’re pretty, and colorful, and all that, well, it may just be a happy coincidence. That hints that they’re not really the color we think they are, at least to another fish. What is visible, even conspicuous, to us may be invisible to them, and vice versa. Consider that, while some juvenile land animals are camouflaged to ward off predators, the juvenile forms of cocoa damselfish, beaugregory, threespot damsels, and others are bright and showy. Once they mature, they turn indistinct grey, Rosenthal says. Then there’s what we can’t see. Losey also points out a combination of colors he’s detected in his experiments, using UV-capable cameras. He’s found that some fish have bizarre colors — to us, at least — that include “UV Yellow,” which has both UV and yellow. Think of the combination as something similar in construction, but not appearance, to orange, which has, of course, both yellow and red. “It’s neither UV nor yellow, and we had no idea it exists,” Losey says. Losey, who is a fish behaviorist, says it would be possible to see almost exactly how fish react to different colors, but that would involve training them to respond when they see particular colors in a lab. While it would be time-consuming, it’s all possible — in fact, similar research has been done on goldfish and zebrafish — but there’s not much funding available for the rank-and-file reef fish, so no one has. Yet, he says this would be interesting because it would help researchers determine why they’re colorful in the first place. “The conventional explanations for why they are colorful don’t really work,” Rosenthal says. Bright colors are useful to advertise that the species is dangerous or bad-tasting — for example, poison dart frogs in the Amazon and coral snakes or monarch butterflies in North America. So, too, in some fish — the butterflyfish has spines, and the scorpionfish will display colorful pectoral fins when they’re frightened. And while that’s all well and good, most brightly colored reef fish are actually pretty tasty. At least to humans. Bright colors could also help fish attract mates. For instance, in birds, brightly colored male peacocks are perhaps the best example, but that doesn’t work with most fish. For example, in Picasso triggerfish and Queen angelfish, the males and females are equally colorful, and you can’t tell them apart by looking at them. Why Are They So Pretty? There are, however, two big-picture theories within the scientific community explaining why fish are so colorful. One was first considered by Alfred Russel Wallace, a less-known but equally significant contemporary of Charles Darwin in the 19th century. 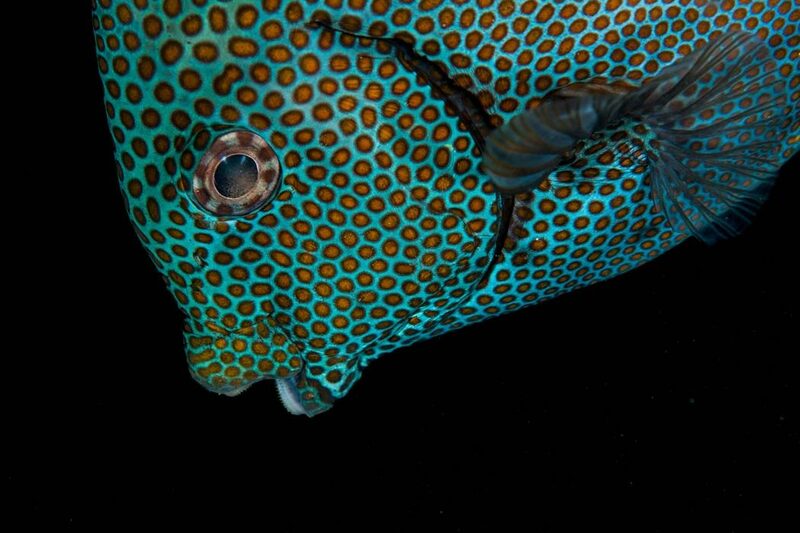 Wallace suggested that the bright colors worn by reef fish may actually help them hide in an equally colorful environment. While fish are pink and green and purple and blue, so are the corals, sponges and other parts of the visually complex background behind them. “He said, well, these colors might actually have a protective function — they might actually function like camouflage in a sense against these heterogeneous backgrounds,” Rosenthal says. The other idea is one developed by biologist Konrad Lorenz in the mid-20th century. He suggested that fish are conspicuously colored to help them identify their own species in the crowded reef environment, where there is direct competition between not only other species, but also members of their own. Consequently, colors may allow for individual recognition. Even with some reef fish’s intricate color pattern, no two are exactly alike. In his research on cleaner fish in the Indo-Pacific region, Lorenz studied striped cleaner wrasse (Labroides dimidiatus). While he couldn’t tag the little fish, he could photograph them and tell the difference between individuals by their markings in photographs. “If we can, you can bet they can,” he says. By having “iconically different” color patterns, Rosenthal says, fish are able to minimize the costs of aggression — in other words, if you’re different from everyone you’re not competing with, you’re not going to have a lot of inter-species conflict that would sap your energy. To test both Lorenz’s and Wallace’s ideas — that is, to determine if fish have evolved to be colorful in colorful environments and to evaluate what information is communicated by coloration — Rosenthal has been comparing fish from the Caribbean with their related species in the eastern Pacific. Prior to the Isthmus of Panama being formed — about 2 million years ago — the two bodies of water, which were then still one, had a single common reef fish fauna around both sides of America. Since then, those two habitats have changed considerably. The Caribbean has bright clear water with coral reefs and, for the most part, the eastern Pacific doesn’t. After the isthmus closed, reef-building corals in the eastern Pacific went extinct, and there was a massive shift in ocean currents that caused upwelling along the West Coast, which caused murky water conditions full of plankton and rocky reefs. Compared with those in the Caribbean, West Coast reefs — stretching from Baja to the Galapagos — are relatively simple visual backgrounds. Two million years, as it turns out, is recent enough history that there are about 100 species of fishes in the Pacific whose closest living relatives are in the Caribbean. Those species have had to independently solve the problem of moving to this different visual environment. One of the ways they’ve done it is to use light conditions to communicate signals — mating, camouflage and territory — in a context that matches the clarity of the water. As a result, the fish in the Pacific are darker than their cousins in the Caribbean. Dark matches dark background, bright matches bright background. Furthermore, the fish colors in the Pacific are muddier — you generally won’t see the bright reds and oranges, and instead get muted browns, whites and blacks. The patterns of these West Coast fish are also simpler, compared with the intricate dots, swirls, and lines of Caribbean fish. “The reason for this is that there’s less light available in the Pacific, and there’s more junk in the water that’s going to scatter light and make spatial information harder to interpret, so you have less ‘bandwidth’ in the Pacific than in the Caribbean when it comes to being able to communicate visual information,” Rosenthal says. That’s all well and good, considering the East Coast, West Coast geography. But Rosenthal says environmental changes in parts of the Caribbean are causing some disconcerting changes to the reefs that may affect the fish that live there. If reefs continue to degrade — and the affected areas increase — fish won’t be able to hide, or find one another through the worsening water conditions to, say, mate. Instead of brightly colored complex backgrounds, the brightly colored fish would live on dark, visually simple backgrounds. Think nice car in the rough section of town. “It’s kind of scary,” Rosenthal says. And it’s not just because of the rate of decline, which is apparently occurring much faster than fish can adapt, or because of the perilous state that it would put these colorful fish in, but also because it may leave a fascinating question unanswered. As a result, the worst-case scenario would leave us without fish so colorful that normally reserved scientists were inspired to name them after great thinkers and artists. And in the worst of the worst, we’d be left without fish so colorful that young people far from the sea were inspired to ask why.